Email to learn more: petsintheparkvolunteers@gmail.com. Volunteers are needed to help with the coordinating the many aspects of this exciting event. If you love to organize things, we would love to hear from you. Volunteers are always welcome! If you would like to help, drop us a note at petsintheparkvolunteers@gmail.com. Set-up volunteers are needed for the Saturday night prior to the event, as well as for first thing Sunday morning to get everything in place for the great day. Take-down volunteers are needed to make sure that everything is put away on Sunday after 4 pm and leave the park in the best shape possible so that we are allowed to continue to use the park for the animals. Event day is a massive undertaking with lots to do. We can’t do it without you! Bring your energy and your passion for the animals and we’ll be happy to have you participate in this great event! Have a look at our new video to learn more about volunteering at Pets in the Park. Thank you for your interest in Pets in the Park and for your support of the animals that this fundraiser helps. 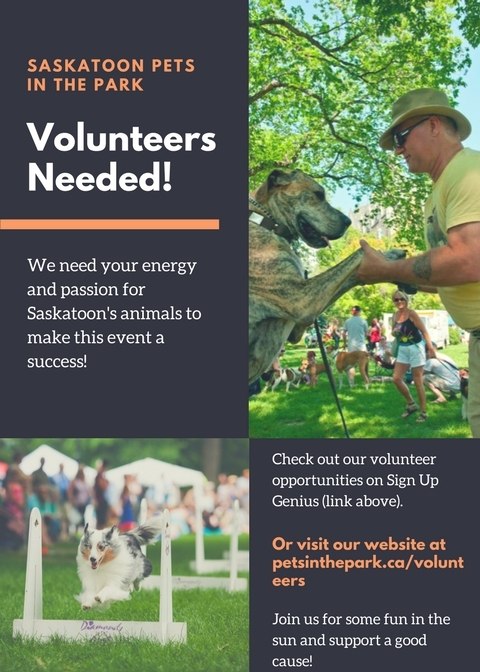 A great big thank you to the hard working members of the Saskatoon Pets in the Park Committee. The number of people helping on the Committee grows every year. Lots of work to do…great people on our PIP team. Thank you also to the many, many volunteers who help us make this event the success it is every year! Many great photographers lend their time and talents to taking and sharing their wonderful photos of our event. See the photos in our Galleries.